You’re not going to believe how easy this recipe is. It takes moments to prepare and just 10 to 15 minutes to cook. And it tastes like pure summertime. Sole is one of the fish varieties readily available here (yes, sadly in the frozen section) so I have been cooking a lot with it (remember the Sole Meuniere?). While I usually pan fry it, I got the yen to bake it. Beth had shared some of her beautiful purple basil with me and I was inspired. I simply topped the sole with a mess of chopped tomatoes, basil, and garlic (one of my favorite flavor combinations) and baked it for about 15 minutes. That’s it. It was super fresh-tasting and light, perfect for a hot day (yes, it’s still incredibly hot in Israel). You could probably go easier on the tomatoes (I know, you can’t even see the sole under all those juicy red tomatoes), but I loved it as is. I served it with boiled red potatoes with plenty of lemon and chives, but any vegetables, rice, couscous, or even pasta would make nice accompaniments. Preheat the oven to 350F. Drizzle olive oil on a baking pan. Pat the sole filets dry and lay on the oiled baking dish. Sprinkle tomatoes, most of the basil (reserve some for garnish), and garlic evenly on top. Drizzle with a little additional olive oil and season with salt and pepper. Put in the oven and bake for about 10 to 15 minutes, or until done. Garnish with remaining basil and serve immediately. Sole is a very adaptable fish, perfect with almost everything! And I like so much this tomatoes version… fresh and light! This recipe is definitely easily adaptable to serve one. Also, since sole is such a mild fish it’s a good introduction to people who think they don’t like fish! Thank you!! That basil was sooo good – so fresh and flavorful! Thanks! Sounds simple and delicious. 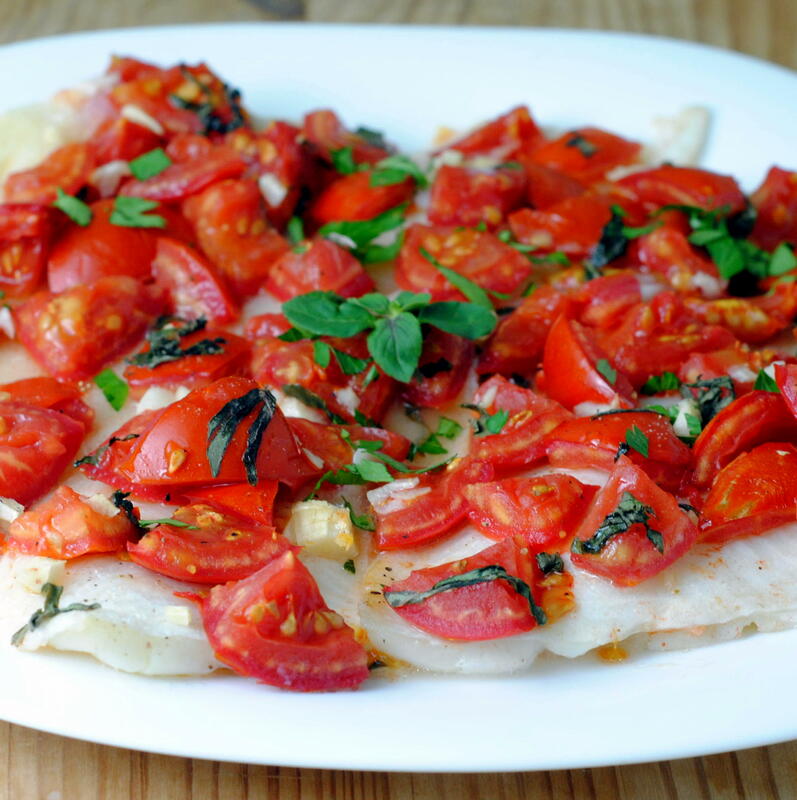 We love to make simple fish dishes but I dont think we every tried sole. Thanks for stopping by, have been going through your blog for the past day. I am in the process of kicking my writing up a notch and hoping to get more gigs in this industry. I am sure I will be spending more time on your web site. Thank you! Sole is delicious, much like other mild white fish. I’ve enjoyed checking out your blog as well, it is great! Good luck getting more writing gigs! Freelancing is definitely not easy, but well worth it! Love this! Fast and flavorful. I can’t wait to try it this weekend. Thank you Lori! I hope you enjoy it! Beautiful dish, I love this! Tomatoes, basil, and garlic are one of my favorite combinations too. Thank you so much! Seriously, you can’t go wrong with tomatoes, basil and garlic. Nice, tasty recipe. Just checking, should potatoes be tomatoes in the recipe? Beautiful!!! I’m going to be sad when the summer tomatoes sort of die out. I’m keeping my basil plant indoors though so I can have it through the cold! Yes, this looks so easy and simple, yet good part is it’s beautiful and yummy!! I totally appreciate this kind of dish…as weekdays with kids’ activities are so chaotic. Thanks for sharing this recipe Katherine! Thank you Nami! Yes, it really is the ultimate weekday dish as it can be thrown together in minutes and is healthy AND tasty! Thank you Biren! Yes, it would be lovely with buttered rice or couscous, yum. This is so light and easy and sounds sublime. Lovely!